The definition of "becomes infinite"
INFINITY, along with its symbol ∞, is not a number and it is not a place. When we say in calculus that something is "infinite," we simply mean that there is no limit to its values. Let f(x), for example, be . Then as the values of x become smaller and smaller, the values of f(x) become larger and larger. No matter what large number we name, it will be possible to name a value of x such that the value of f(x) will be larger than that number we named! We then say that the values of f(x) become infinite, or tend to infinity. We say that as x approaches 0, the limit of f(x) is infinity. Now a limit is a number. So when we say that the limit of f(x) is infinity, we mean there is no limit to its values. There is no number that we can name. The student should be aware that the word infinite as it is used and has been used historically in calculus, does not have the same meaning as in the theory of infinite sets. See the well-known quote by Carl Friedrich Gauss. DEFINITION 4. becomes infinite. We say that a variable "becomes infinite" or "tends to infinity" if, beginning with a certain term in a sequence of its values, the absolute value of that term and of any subsequent term we name is greater than any positive number we name, however large. In both cases, we mean: No matter what large number M we name, we get to a point in a sequence of values of x that their absolute values become greater than M.
Definition 4 is the definition of "becomes infinite;" it is not the definition of a limit. As for the symbol ∞, we employ it in algebraic statements to signify that the definition of becomes infinite has been satisfied. That symbol by itself has no meaning. As the sequence of values of x become very small numbers, then the sequence of values of y, the reciprocals, become very large numbers. The values of y will become and remain greater, for example, than 10100000000. y becomes infinite. 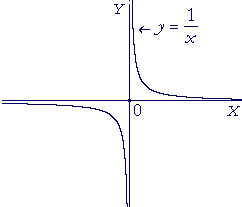 When a function becomes infinite as x approaches a value c, then the function is discontinuous at x = c, and the straight line x = c is a vertical asymptote of the graph. (Topic 18 of Precalculus.) The graph of y = , then, is discontinuous at x = 0, and the straight line x = c is a vertical asymptote. Next, let us consider the case when x becomes infinite, that is, when its values become large positive numbers to the extreme right of 0. We should read that as "the limit as x becomes infinite," not as "x approaches infinity" because again, infinity is neither a number nor a place. On the other hand, we could read that however we please ("the limit as x becomes dizzy"), as long as whatever expression we use refers to the condition of Definition 4. See First Principles of Euclid's Elements, Commentary on the Definitions. See especially that a definition is nominal; it asserts only how a word or a name will be used; and we must agree to that. In other words, whenever x becomes infinite positively or negatively, the values of y = approach the horizontal line y = 0. That line is called a horizontal asymptote of the graph. where f and g are polynomials (g 0). Apart from the constant term, each term of a polynomial will have a factor xn (n ≥ 1). Therefore let us investigate the following limits. c could be any positive constant. The student should complete each right-hand side. x above, where n = 1. According to 1), above, the limit of each term that contains x is 0. Therefore by the theorems of Topic 2, we have the required answer. In similar cases, the first step is: Divide the numerator and denominator by the power of x that appears in the leading term of either one. The result follows on dividing both numerator and denominator by x.
then the limit as x becomes infinite is equal to the quotient of the leading coefficients. When the degree of the denominator is greater than the degree of the numerator -- that is, when the denominator dominates -- then the limit as x becomes infinite is 0. But when the numerator dominates -- when the degree of the numerator is greater -- then the limit as x becomes infinite is . On replacing x with , we let z become infinite. The limit remains 1. Problem 5. In the above limit, change the variable to n, and let it become infinite.